Thank you for deciding to come to the ILC Home & Commercial Clams Networking Lunch on Friday 17 May. We are looking forward to seeing you at the Grand Connaught Rooms. 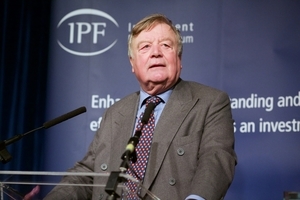 Welcome to the stage Ken Clarke, current Father of the House as one of the longest-serving MPs in the country. Having worked within Parliament for over four decades he’s served the Heath, Thatcher, Major, Cameron and May administrations. Highly respected by all sides of the parliamentary divide, his occasionally controversial views on the economy, law and order, and Europe are informed and a pleasure to listen to. To complete your purchase, please click on the New Registration icon. You will then be asked to enter an email address followed by your company details. If you want to purchase more than one ticket, just add the email address of the other guest(s) and their company contact details. When you Complete Registration you will be asked whether you would like to pay by Invoice or PayPal. Full payment is required within 30 days of invoice date. If you wish to cancel, we require 21 days written notice prior to the event. Your booking will then be refunded minus £20 administration charge. To modify your booking you will need your e-mail address and the booking reference number we e-mailed to you.